So the winners were @richardphipps on twitter, and Patrick from Ontario. You see Canada? We like you here at newbiedm.com. Stop bitching. So here we go with another contest, courtesy of Gator Games and myself. The good thing is that we’ve learned to speak Canadian for this contest, eh, so you canucks up there are now eligible to enter! We will select two winners for this contest, and each one of you will win a copy of the book. Entering is easy, leave a comment below, or find @gatorgames and myself on twitter (@newbiedm) and send us a message telling us it’s for the contest. The kids call that tweeting, you see. On saturday night, at 11:59pm easter, 8:59pm pacific time the contest will end, and I’ll select the two winners on Sunday. In all seriousness, take a few minutes to sample their site, you never know what you may find. Good luck, and it’s not a bad book btw, I reviewed it earlier this past week. Awesome. I’d like to enter. Appreciate all of the sweet contests you’ve been running. I’d love to win this book! And keep up the good blogging! Great! My Dragonborn players will love this. Alrighty, I’m in! Thanks Gator Games, and NewbieDM! Thanks for the new contest. My first entry ever! Thanks for learning to speak Canadian! Looks like a great book, would love to get my hands on a copy! Sure, why not, I’ll enter. I’ve got nothing to lose except more hope of my place in the world being one not entirely of suffering. I’d like to enter the contest. Thanks much to you and to Gator Games! Just found this site and I really appreciate the tutorials/downloads. Really interested to learn more abort the Dragonborn and Arkhosia. Thanks Gator Games, and NewbieDM! OK, I give this content a try! Well, never let it be said that Deadorcs has missed a contest. Besides, I have a player that would LOVE to get this book. Sign me up! Dungeons, Dragons you say? Well then I’m there. I’d like to enter the contest. Thank you to you and Gator Games! Likes me some dragonborn. I’m in. Thanks to Gator Games and NewbieDM and good luck to everyone. Always happy to enter a contest, unfortunately not always happy enough to have won one. This time different? I loves me some Dragonborn! I would also like to win — looks like a very good enjoyable book. Gator Games is the Greatest! … and Newbie DM is pretty cool too. My players were eyeing this up the other day, awesome! I love Dragonborn and would really like to win this one. I’m in! Love your blog! I have been playing a Dragonborn for over a year. I would love to add this book to my collection. @DiceGolem says, count me in! Here’s to hoping my Dragonborn player AND my Dragonborn villan are about to get some shiny new toys… Count me in! Thanks for the review, now I might have to pick this one up! Oh well, who needs to eat? Feed the DM should be a rule in the PHB. Finally a contest for us Canucks! I would love to enter! Damn straight! Canadians need reasons not to go outside, too! Contests? I love contests! Sign me up! Always fun to enter your contests and I kind of like the Dragonborn. I’m totally enthralled. Count me in! I’d like to get in on this contest! I’d love to get in on this contest! I have a Dragonborn player in our current game and this might be just the thing to get him a bit more engaged! Thanks for running another contest! Keep up the great work on the blog. Stoked that you included us Canadians, keep it up newbiedm! YAY! Would love to have this book. 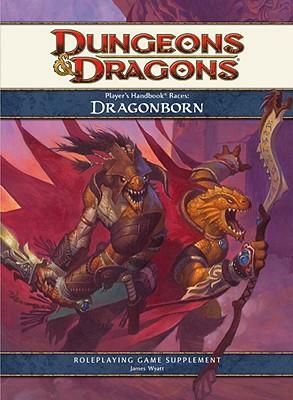 I have two different Dragonborn in my party, I’d love to make them fight over this book! I’m in. And finding it hard to resist buying Magic cards from Gator Games, even though I already have so very many. Hey, been reading your site for a while, and love the articles you have written. Here is my entry for the contest as well. As the father of a 7 year old playing a dragonborn character, this would sure come in handy! This would be great to flesh out the Dragonborn Barbarian in my campaign! I would really enjoy winning a copy for myself, thank you! I’ll throw my hat, pointy as it is, in the ring as well. Told my 13 year old I’d get him a copy, so if I can get it for free, all the better! One day your Gator Games giveway conttests will speak Filipino. I’d like to enter in the drawing. Seems like a book I may pick up once I pay off bills next month. Nice giveaway, finally some love for us canuks in these Twitter contests. I’m a Canuck, and I would like win your book, good sir! I’m a little torn on the dragonborn. I’ve no problem with making D&D more overtly “dragony” with a PC race like this, but I wish the description in the Core books was something that couldn’t have been simply summarized as “Klingon”. Perhaps this book helps that problem? OH OH OH! Pick me!!! Thanks to both of you for providing these contests. I am in. Gator Games is the best game store in the Bay Area. I love local game stores. Especially those that reward their patrons! Please put my name in the pot! Keep up the great reviews!!! @exedore6 would like to enter the contest. Canadians? *ENTERS* I don’t have to have it shipped to my ladylove this time! *dances* Well if I win anyway. So you did it the non-annoying way, no having to tweet every day, I approve! Digging on the contest. Thanks Gator Games! Open to Canada? I’m in! Put me down as entered! I really appreciate the frequency at which you update. Keep up the great work. I would love to win this, it looks to be a lot of fun. Thanks for the blogging and making sure you can get us cool contest winnings. Give me a handful of dragonborn awesomeness!!! Count me in. A very huge Thanks You for all you do for us gamers. Getting in on this. Thanks for the contest! All kidding aside, this is a great prize and both you and Gator Games are awesome. Thanks for all the great work you do. Reporting in! Want in on the contest! I want to “look like a Dragon”! I recently stumbled upon both Gator Games and NewbieDM earlier today. I have added both to my Twitter following list and plan to keep up with your activities. No matter who wins the books I am sure they will end up in good homes! I thank you and your sponsor for the generosity! You know up here in Canada when it’s -40 and I’m stuck in my igloo because my dogsled won’t start and I can’t make it to my game session…. Kidding aside, Thanks for all the work you put into your site. It is very helpful. Thanks as well to Gator Games for donating the prizes, I would love to win. If I do win a copy, when you send it to me could you send a bottle of rum as well, cause damn it’s cold up here! Cheers! So the winners were @richardphipps on twitter, and Patrick from Ontario. Congratulations and stay tuned for the next giveaway.